MADERA, CALIFORNIA (March 10, 2013) – Since the Madera Jr. Late Model Series was announced last fall it has been a hot topic in the racing world. The first race event for the new Jr. Late Model Series is this Saturday night March 12th at the LoanMart Madera Speedway, and 51FIFTY Energy Drink has come onboard as the title sponsor for the new series. Drivers ages 10-16 years old in the 51FIFTY Energy Drink Jr. Late Model Series will gain national exposure thanks to all eight races 50 lap races in the series being televised on MAVTV as part of a TV package broadcast from LoanMart Madera Speedway in 2016. The drivers compete in cars nearly identically prepared to the LoanMart Open Late Models. The Open Late Models also will race on Saturday night with a blockbuster field competing in a 125 lap feature for $5,000 to win. “51FIFTY Energy Drink is a company that is rapidly growing and I think it is a perfect fit for our innovative Jr. Late Model Series. We have a strong plan in place to grow the series and sponsorship over the next three years, and we are excited about our relationship with 51FIFTY Energy Drink for the Series” Kenny Shepherd. The 51FIFTY Energy Drink Jr. Late Model Series competes in full size late models once a month in an eight race championship at the LoanMart Madera Speedway in 2016. The first race is on March 12th and the last race is on October 8th. For more information about the series please visit www.racemadera.com. For more information about 51FIFTY Energy Drink please visit www.51fiftyenergydrink.com. Friday and Saturday, March 11th & 12. The Good Times group will be presenting the Stan Pavey Memorial at their home track in Madera this weekend. The action begins on Friday with an open practice session from 4 to 8pm. Saturday race day will begin with another practice session, at 9:30am, followed by qualifying rounds and main events for the association's seven racing classes. Sanctioned by Region 11 of Quarter Midget Racing of America, this outstanding program is specifically designed to develop the driving talents of boys and girls age five through 16. Saturday, March 12th. If you love crashing and bashing on purpose, then you'll love the IEC's Night of Destruction presented by Pick Your Part and Seidner's Collision Centers. The bump and grind action will be provided by the Pick Your Part Compact Car Demolition Derby, Enduro Racing and Skid Plate Racing, sponsored by Seidner's Collision Centers, plus the mayhem associated with Trailer Racing. There's also going to be some oval racing from the always exciting Robertson Solar Wear Southwest Tour Trucks. The spectator gates will open at 4pm followed by an on track autograph session at 545pm and racing at 7pm. Pre sale general admission tickets are available for $10 online or at the speedway office. On Saturday race day these tickets will go for $15. Kids tickets are $5. There's also a $5 parking fee payable in cash. Saturday, March 12th. The American Heart Association Men Go Red will host the inaugural Car Show and Breakfast, presented by Dignity Health along with Mercy and Memorial Hospitals, on Saturday from 9am until 4pm. The VIP breakfast buffet and key note speaker will begin at 9am. Key note speaker is famed motorcycle dare devil and stuntman Robbie Knievel. Tickets for the VIP breakfast are $20, age 12 plus, and $10 for kids under 12. General admission tickets, age 12 plus, for the car show only are $10 with kids 12 and under admitted free. Join Us at the Men Go Red Breakfast & Car Show! Sunday, March 13th. Here's a really good idea that calls for thinking and working outside of the box. Kern County RWP will be presenting Racer Appreciation Day. It's a special way of thanking their drivers and race team by treating them to a free open practice session this Sunday. The session will run from 9am to 5pm. The racing divisions that run on the smaller tracks configurations will practice in the morning hours followed by practice on the half mile oval in the afternoon. Saturday, March 12th. Anytime this speedway unlocks its spectator gates it automatically becomes a hot ticket. They're going to prove that point this Saturday night when the open their new racing season which also happens to be season number 45. Highlighting the racing action will be race #1, of the MAV TV televised, Loan Mart Open Late Models who will run a 125 lap main event that pays $5,000 to win. Also on the schedule is race #1 of the newly formed Junior Late Model Series, running a 50 lap main, along with a 40 lap main from the Super Hobby Stock Series plus the popular Toyota Sedan and MST divisions. Saturday race day begins with practice at 1pm followed by qualifying at 3pm, heat races at 530pm and main events at 6pm. General admission tickets, age 13 plus, are $15 and $13 for seniors and military personnel. Kids tickets, age six to 12, are $7 while kids five and under are admitted free. LEMOORE, CALIFORNIA (March 8, 2016) – Northern Alberta Canada's Ben Silliker, 11, will take on asphalt Late Models as part of a busy racing schedule as a Team Silco Racing Development Driver in 2016. After a 2015 campaign of 72 main events with seven race wins, Silliker sets his sights on a transition to pavement as part of a nearly 90 race effort this year. Team Silco Racing has relocated from Northern Alberta Canada to Lemoore in the central valley of California to attack the increased race program. Silliker's schedule includes a run for the televised eight race championship in the new Jr. Late Models on the paved Madera Speedway in Madera, CA. The one-third mile asphalt oval is the first in the world to offer full size stock car competition for drivers ages 10-16 in 50 lap features. All events in the series will be televised on MAVTV with Silliker's season debut this Saturday March 12th. In addition to the Madera action, Silliker will compete in nearly the entire Restricted 600 Micro programs at both Plaza Park Raceway in Visalia, CA and Lemoore Raceway in Lemoore, CA. Silliker also has several races at Delta Speedway in Stockton, CA and Dixon, CA's Dixon Speedway within his 50 race Micro schedule. Silliker opened his Micro program with the NOW600 series in Greenville, TX in February with a pair of second place finishes. The Team Silco Micro Sprint program includes major events such as the CA Speedweek and Clay Cup in July and the Turkey Bowl XVI in October. On the Outlaw Kart side, Silliker will continue to be active with his largest focus on the second annual Kyle Larson Outlaw Kart Showcase at Cycleland Speedway in Chico, CA in September. 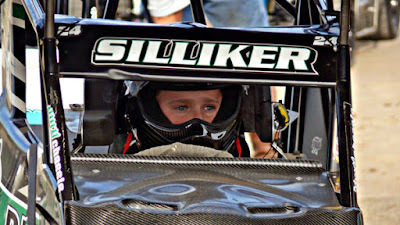 Silliker will race in Atwater throughout the summer in preparation for the Showcase. He also made several starts in January and February in the Chowchilla Barn Burner, picking up a win in the Non-Wing 500 class along the way. Across asphalt and dirt, Silliker's program will be either televised or live streamed approximately two dozen times this season. The media program surrounding Team Silco will bring his new sponsors Hamblin Motorsports, Micro Blue Bearings, Vahlco Wheels, and Motion Media Wraps increased exposure throughout the season. Steve Hamblin of Hamblin Motorsports joins to crew chief the Micro Sprint program, while long time supporter Grant Edwards of Evolution Racing Products will head the asphalt Late Model team. Steven Blakesley of Blakesley Sports Media will return to handle media for the team. Racing action gets underway this weekend at Madera Speedway for the 2016 Jr. Late Models. Practice is tentatively scheduled for Friday night with the 50 lap feature on Saturday night. The race will be filmed for MAVTV for a tape delay broadcast. Race fans can keep up with the action at the team's official website www.TeamSilco.com or on Facebook and Twitter. Many of Team Silco's events can also be followed on Race Monitor. Team Silco Racing is presented by Hamblin Motorsports, Micro Blue Bearings, Evolution Racing Products, Blakesley Sports Media, Vahlco Wheels, and Motion Media Wraps.